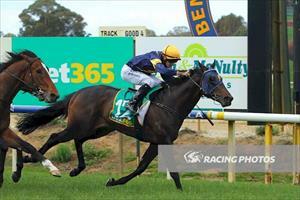 Three runners for the stable at Ballarat on Wednesday when Prince Of Arran, Lord Barrington and Zume Forward run. Zume Forward is the first to go in race two, the 2YO Fillies Handicap over 1200m with Jamie Mott to ride. The daughter of Charge Forward finished fifth on debut at Benalla behind the subsequent Group III winner Marcel From Madrid and Mike Moroney has made a change of gear for Wednesday’s race. “We’re very happy with her going into the race and we’ve just made a gear change to help her,” Moroney said. “She will race in a different bit which will help her to race straighter - she was a little bit wayward last time and we think this will help her. Lord Barrington is also racing for the second time this preparation when he tackles race five, the Benchmark84 Handicap over 1000m with Brian Higgins to ride. Lord Barrington finished fourth first-up over 1000m at Sandown two weeks ago and has pleased Moroney since. “He has come through his first-up run really well and this looks an ideal race for him,” Moroney said. Prince of Arran (pictured) steps up to 1600m in race seven, the Benchmark 64 Handicap over 1600m with Brian Higgins to ride from barrier one. “I thought his first-up run was solid and he has worked strongly going into this race,” Moroney said. “I’ve decided to give him another run without the blinkers and we will know more after today's run if he needs them back on or not.